Oceanco is one of the world leaders in the construction of custom yachts of more than 80 m. In 30 years of activity it has delivered 2.2 km of yacht. Based in Holland, it is able to build yachts of up to 140 m. It employs more than 250 people. Last July Oceanco outdid itself with the delivery of the 110 m (361ft) Jubilee. It was the largest super yacht ever built by the Dutch yard and in Holland generally. In February it delivered Barbara (88.5 m) and in April Bleak Pearl (106 m). In 2016 it had built Aquijo (85 m) in collaboration with Vitters. Today there are six yachts of more than 90 m under construction. Oceanco today has 12 yachts in the top 100 largest yachts in the world. It is a relatively young yard, formed in 1987 and it is probably the absence of long traditions, which can sometimes way down and limit, that has made it a versatile and modern yard that is not frightened of challenges and innovation. In fact it seeks them out. As they say in the yard: “Some things, it seems, can’t be done. Perhaps just because they’ve never been done before. It needs an open mind, an innovative mind. A mind focused on finding solutions. On surpassing expectations”. Even the decision to work with different leading designers such as Terence Disdale, Nuvolari Lenard, Espen Øino, Sam Sorgiovanni, Andrew Winch and Luiz de Basto is a continuous stimulus and fundamental for not standing still but continuing to innovate and find new solutions and proposals. Oceanco is also sponsor of the “Young Designer of the Year” show which rewards the best projects by students under 25 years of age. 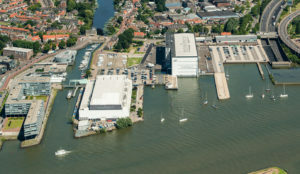 After various extensions, today in Alblasserdam, near to Rotterdam, are the two Oceanco outfit facilities. 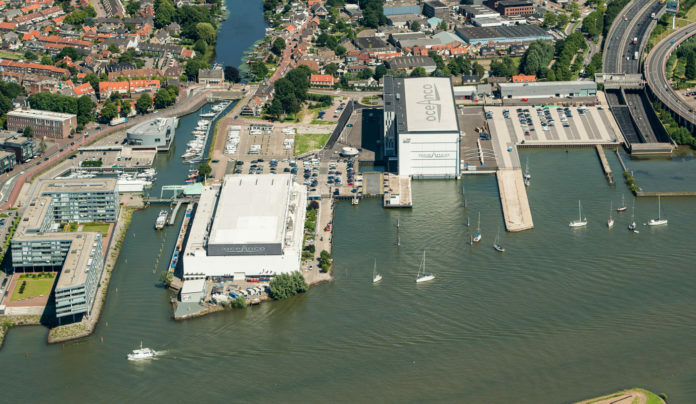 Here work can be done on two yachts of up to 100 m and one of up to 140 m. The latest facility to be built (for yachts of up to 140 m) is an impressive structure, 146 m long, 52 m wide and 32 m high, where up to 1000 people can work together – the Oceanco team, subcontractors, owners’ representatives and crew – and the space is divided into access restricted zones to assure safety and confidentiality. Large hulls in steel are built in their hull building facility a few miles downriver from Albasserdam and the superstructure is in aluminium are made by the Polish Aluship. Then there is the headquarters in Monte Carlo which houses the design, sales, marketing and administrative offices. Staff number 250. Jubilee, the biggest, but for how long? As mentioned, June saw the delivery of Jubilee. 110 m overall with a beam of 16.4. Very original are its profile and its progressively longer horizontal blue lines that make it unmistakable. The exterior is by Lobanov Design, the interiors by Sam Sorgiovanni Designs. The gross tonnage of the yacht is 4500 tonnes and it has a top speed of 18.5 kn. On board is a fully certified helicopter operating deck forward with a concealed mooring deck below. Viewed from above, her curvaceous lines lead aft to a large pool deck with built in Aquarium and substantial beach club below. Built to the Passenger Yacht Code, it can carry up to 30 guests in 15 staterooms including an entirely private owner’s deck. Aquijo is the result of collaboration between Oceanco and Vitters, 2 yards that joined forces to build a megayacht that for Oceanco is its first sailing yacht and for Vitters the first of its size. 85 m overall, it is impressive for its sheer size. Designed by Bill Tripp it is a fast cruising ketch with steel hull and aluminium superstructure. The mainmast of Aquijo at 91 m is one of the tallest in circulation and it carries 5300 m² of canvas with a main, jib, and Code Sails. The interiors are by Dölker + Voges Design: a separate master suite on the aft side of the top deck features breathtaking 270 degree panoramic views and a large sliding door that opens to a private exterior deck which offers a separate bar, dining and lounging area. There are six guest cabins on the lower deck where there is also the beach club with Jacuzzi, steam room and sauna. It carries a crew of 18. After Aquijo, Oceanco launched (but not yet delivered to the owner) the 106 m Black Pearl created in collaboration with Dykstra Partners & BMT for the naval architecture and designers Ken Freivokh, Nuvolari Lennard and Gerard Villate: it is the largest Dyna Rig sailing yacht in the world, with three 70 m masts. Now being built in the yard is a new 109 m sailing yacht.